I installed the colt '51 set in my '52 reissue telecaster. I decided to change the original pickups because wanted a bit warmer tone and I wanted to experiment different pickups. When I bumped into the colt '51 set I had to try it out. 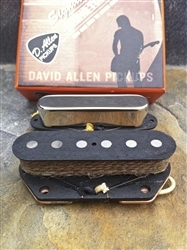 After having the colt '51 set installed, I can say that The D. Allen pickups have the added value I was after - warmer and fuller tone. Great sound!